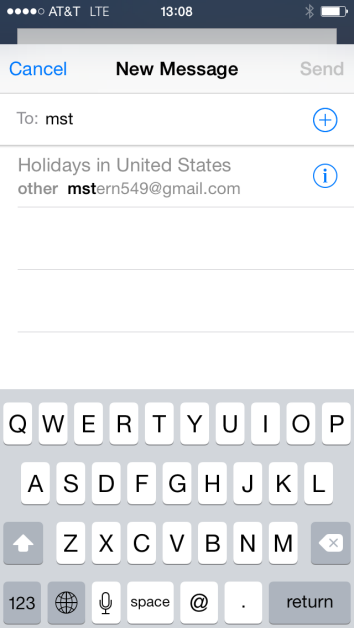 Gmail, iPhone Mail bug may change your name to Holidays in United States. Yes, this is my personal email address, but please continue to send hate mail to mark.stern@slate.com. On Wednesday, I attempted to write an email to myself through the Mail app on my iPhone. But as I started to type in my email address, I noticed something rather odd: Gmail had changed my name from Mark Joseph Stern to Holidays in the United States. Neither Apple nor Google appears to have any idea why this is happening, and neither returned my calls for comment. Naturally, tech sleuths have already offered a variety of wildly complex fixes for this bug. But I prefer this fast, elegant solution. Go to your contacts and find your own contact—that’s the one marked “me.” Then hit “edit,” “add email,” and add your Gmail address. For reasons beyond my comprehension, Holidays in the United States (or wherever) should now be replaced with your real name in the Mail app. I implemented this fix on Wednesday afternoon, and everything still seems to be working fine. But a word of advice: Don’t rush to repair the Gmail bug. One day later, I’m a little nostalgic for my unsought nickname. We’re bludgeoned with our given names day after day, unceasingly, inescapably. Now Gmail’s offering you a brief respite from the monotony. Go ahead. Live a little. Enjoy your Holidays.